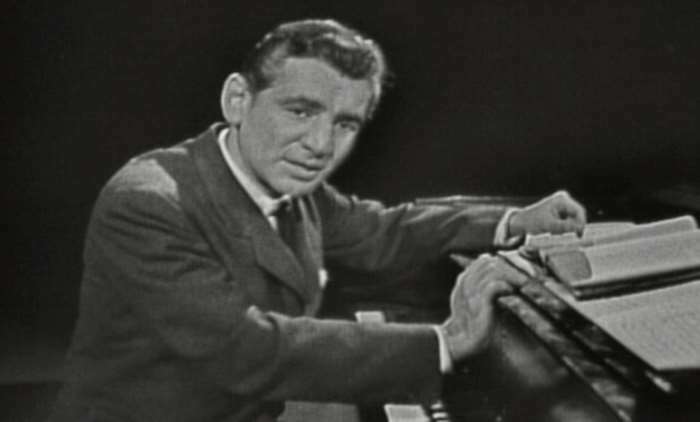 We’ve blogged before about Leonard Bernstein’s appearances on a 1950s television program called Omnibus, "the most successful cultural magazine series in the history of U.S. commercial television," which featured scientists and artists presenting original ideas and compositions. In the documentary available on Snagfilms, Bernstein introduces his audience to “modern music,” including such a more or less classical composer as Stravinsky to the avant-garde instrumentation of John Cage's prepared piano and early electronics of Pierre Henry’s musique concrete. After watching a sextet of “musicians” “playing” transistor radios, Bernstein admits, “Now compared with all these wildest outposts of experimentation… Stravinsky probably sounds tame or more like, well… music.” Bernstein then goes on to make a case for modern, experimental music, hoping to persuade his audience to “hate it less, or hate it more intelligently, or even grow to like it.” He’s a very patient teacher, and he anticipates his students’ first objection to the modernism of his time: “What has happened to beauty?” The beauty of Mozart, say, or Tchaikovsky? In order to answer this question, Bernstein uses easily visualized analogies to baseball and numerous more or less familiar symphonic passages to explain basic music theory—tonality, harmonics, chord structure, scale patterns, melody, dissonance. By the time he comes to describe the conflict, post-Wagner, between atonal composers and more conservative “tonalists” around the twenty minute mark, you’ve got a pretty good idea of what he’s talking about, even if this debate is entirely new to you. It’s a captivating lecture tracing the history and logic of musical composition, and despite Bernstein’s range of references, he’s never esoteric. He had the patience of a Fred Rogers and media personality of a musical Carl Sagan (and, oddly, some of the mannerisms of Rod Serling). Like Rogers and Sagan, he was part of an age when television presenters could be educators first, entertainers second, and solipsists not at all. Luckily for us, we’ve got him on Youtube. See also Bernstein’s Omnibus lectures on Beethoven and Jazz. The Omnibus series has been acquired by Global Image Works, who host a variety of clips from the show on their site. I’m willing to hate it more intelligently. Musicians are also upgrading their music standards and adding new instruments as technology is upgrading everyday. It doesn’t mean musicians are not using basic music theory. I’ll like to hear what Lennard Bernstein has to say on music theory.